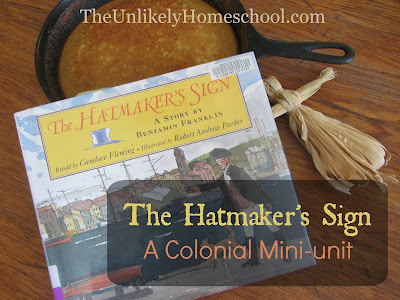 Our homeschool co-op book club stepped back in time through the pages of The Hatmaker's Sign by Candace Fleming. This living-literature book is a parable as told by "Benjamin Franklin" who attempts to encourage a downhearted Thomas Jefferson during the drafting of the Declaration of Independence. Since our book club consists of the six and under crowd, this story made for a great, gentle introduction to colonial life and history. Our morning began with a few simple explanations. I held up pictures of both Benjamin Franklin and Thomas Jefferson and gave very simple introductions of each. Then, I displayed a map of the 13 original colonies and briefly talked about the beginnings of our nation. Since the book refers to the Declaration of Independence, I defined the words "declare" and "independence". I also discussed the meaning of the word "parable." 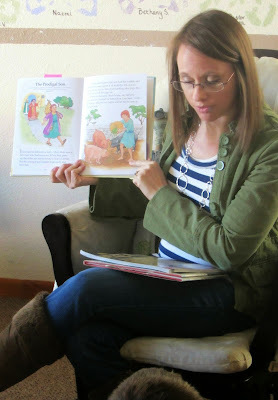 I held up a picture story-book Bible and reviewed some of the Biblical parables that the kids were already familiar with. All of this discussion built a good framework for the main characters, plot, setting, and themes of the book. The parable portion of the book tells of a colonial hatmaker and his many attempts to design the perfect sign for his shop. I passed out blank sheets of paper and markers and encouraged each child to make his/her own hat shop sign. Although he makes and sells many varieties of hats in his shop, throughout the book, the hatmaker wears a tricorn hat. For our snack, I made a traditional Johnny Cake (corn bread) in my cast iron skillet. Although this tasty treat wass not necessarily mentioned in the book, it was a colonial favorite. Since he was such a key character in both the book and in colonial history, I thought it would be fun to show the kids all the many things that Benjamin Franklin invented that we still use and enjoy today. I put together a basket full of items that represented his major contributions to American science, culture, and society at large. Each of the kids took turns pulling something out of the basket. microscope- He was a scientist and inventor. empty medicine bottle- He helped to open the first US hospital. newspaper- He was a noted colonial printer. vegetable seeds- He introduced several crops. piece of wood- He invented the Franklin stove. letter- He was the first postmaster. book- He opened the first circulating library. police badge- He helped organize the first police department and fire department. map- He was a cartographer. 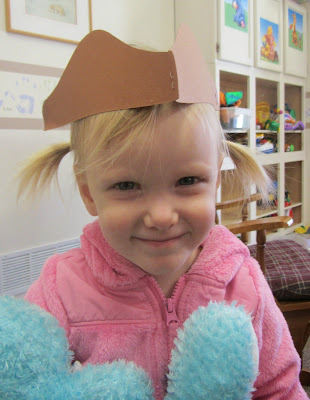 army hat- He was a colonel in the militia. receipt- He owned several businesses and operated a store. weather thermometer- He was a forecaster and wrote Poor Richard's Almanac. wine glass- He invented the glass armonica instrument. For a more in-depth list of Franklin's accomplishments, be sure to check out Ben1776. We watched a few minutes of this re-enactment of Ben Franklin playing the Glass Armonica and then attempted to play a homemade version. I set out glasses filled with different amounts of water. I was able to wet my fingers and twirl them around the tops of the glasses to imitate the sound of the armonica. It was a bit tricky for the kids to do, however. So, they just tapped each glass with a marker to hear the musical scale go up and down. 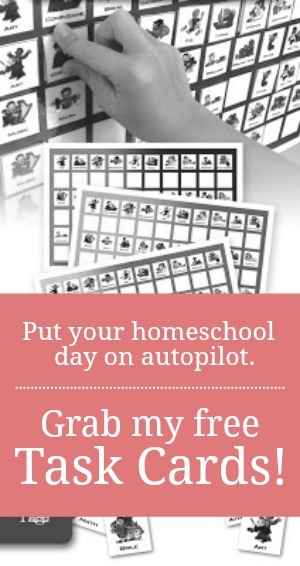 For more book-club or homeschooling ideas, be sure to follow me on Pinterest. What a wonderful study. I love the idea of the basket filled with things to discuss. They had so much fun with it and it made some hard-to-understand concepts easier to understand. This sounds like it was an awesome study! I love the Benjamin Franklin basket! We've been studying Early American history the past two years. It's my favorite historical era so I've kind of drug it out and expounded on it quite a bit. We are just coming to the Civil War now. 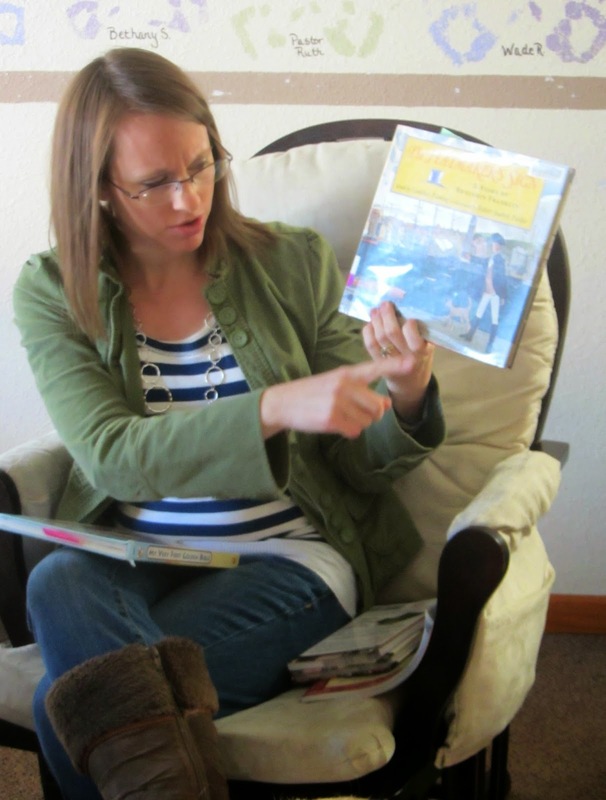 Early American history was our favorite in our own homeschool, too! We will cycle around to it again in a couple of years. Can't wait.